Since June 2018, you can get some individual WordPress fansite themes, highly customizable, here at Inspirationally.net. Here’s the list of features and installing instructions. 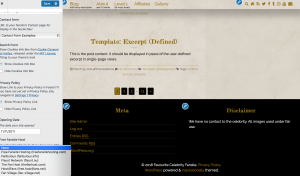 Find instructions for the Inspirationally Universal Coppermine Theme here. As with every theme, go to your Appearance -> Themes section, upload the Zip and activate the theme. 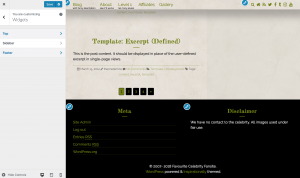 The header image will automatically get the right look for the theme. You don’t need photoshop! Just upload the image and after cropping it to the right size directly inside WordPress it’ll automatically change its look in the theme. With choosing the main color you can make your theme as individual as possible. However, there are some suggestions to get a nice look already. In some themes you can can also set the primary menu position to either the very top, above the header image or under the header image. These will for sure make your life easier. Here, in the Fansite options, you can do many many customisations. Social Media Menu: you can add all your URLs to Social Media sites here, show or hide the home button and search field, add an URL to the contact form. All these links will show up nicely in the Social Media menu with FontAwesome icons. 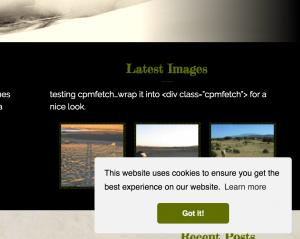 Cookies Consent Popup: you can chose if a Cookie Consent by insites shall be shown in the bottom right, already with colors fitting the theme. Opening date: This will make sure you always have the right Copyright date in the footer. All themes come with 3 widget sections. 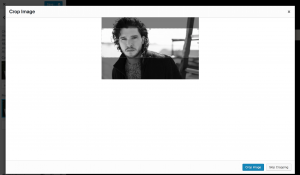 One at the top, one in the sidebar, one at the bottom. Customize to your needs, as long as the link back to inspirationally.net in the footer remains intact. Use it for all of your owned or co-owned sites, but don’t give it away if you adopt the site out or sell it.